Dr. Seuss Treasury is a very good iPad app that provides access to over 50 of the best Dr. Seuss classic books. These works have been particularly adapted for iPad and provides an interactive and delightful reading experience. The app also includes tracking features to enable parents and teachers to monitor kids' reading progress using statistics for the number of books reads, hours spent reading, pages turned and words tapped. The interactive stories featured in this app include all the popular Dr. Seuss characters namely the Cat in the Hat, the Grinch, the Lorax, Sam-I-Am and many more. Other note worthy features of this app include highlighted narration to boost kids literacy skills, tappable words and pictures to develop their vocabulary, integrated search functionality to look up keywords in text, and the ability to sort books alphabetically, by series or by publication date. 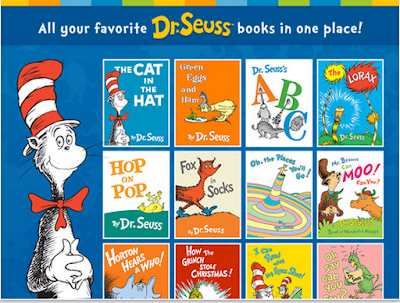 A free download of Dr. Seuss Treasury gives you full access to explore all 55 stories (7-day free trial).Also, always enjoy free access to 1 story per month, even without a subscription!